The thing to notice is that “80” down there. Sometimes, Jose Fernandez throws 80 mile-per-hour breaking balls. This wasn’t one of them. Ortiz said Fernandez threw a changeup. Fernandez smiled and said he threw a fastball. Obviously, it wasn’t a normal fastball. The normal fastball buzzes 96. So, did Fernandez actually throw a changeup, or a slow fastball? I believe the evidence points to the latter. I warned you this would be stupid. In case you missed it — and I wouldn’t fault you for avoiding coverage of the All-Star Game entirely — the showdown between Fernandez and Ortiz generated a lot of attention, and it was because of Fernandez’s pregame comments. Fernandez said he was going to give Ortiz fastballs to hit, and he said he’d even take something off, to make them more hittable. You can never quite tell the difference between honesty and gamesmanship, but that was the setting. Fernandez promised fastballs. Then Fernandez threw 80. Later, there were fastballs, and Ortiz ultimately drew a walk, but that first pitch stands out. The two laughed about it later. OK! Changeup, or slow fastball? It was truly an unusual pitch. Below, I’ve plotted all of Fernandez’s pitches that have been tracked in his career. The pitches are plotted by velocity, and by how they’ve spun, according to the trackers. I folded in Fernandez’s two All-Star Game appearances. There you see the first pitch to Ortiz all by itself. Fernandez hadn’t thrown a pitch quite like this. There’s that one other weird and nearby gray dot, but that pitch was a few ticks faster, and upon viewing, it was unmistakably a breaking ball. Maybe the tracking software hiccuped and got the movement wrong. Maybe it just moved strangely. But that pitch was a breaker, and the pitch to Ortiz wasn’t. It was the definition of an exceptional pitch. This plot is telling in another way. The cluster to the left shows Fernandez’s breaking ball. 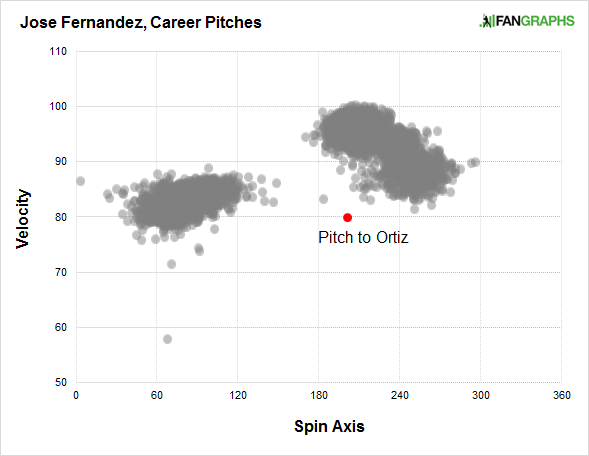 Moving to the right, from there, you get Fernandez’s fastball, and then you get Fernandez’s changeup. If you look at the red dot and imagine a vertical line, it would intersect almost the middle of the fastball cluster. That pitch to Ortiz moved like a fastball. It didn’t have the run of a changeup, nor did it have a changeup’s sink. It behaved like a usual fastball. But for, you know, the speed. Speed, though, is pretty easy to modify. The movement tells us about the grip, and the grip tells us about the intent. Let’s watch the pitch! You might spot something immediately. If not, we’ll get there in a minute. The actual changeup clocked in at 90. If anything, that one was slightly overthrown. As you look at those two clips, you might be able to realize that Fernandez’s first delivery was slowed down. He did pretty much everything the same — he just did it slower. In the first clip, Fernandez takes 2.5 seconds to release the ball, from first movement. In the second clip, he takes 2.0 seconds, which is 20% faster. Fernandez just didn’t throw the first pitch at full speed, and while we sort of already knew that, you can really see it in the follow-throughs. Here are three from the same few minutes. You see Fernandez after the first pitch, after a fastball, and after a changeup. He threw the first pitch free and easy. So there was diminished forward force, which allowed Fernandez to keep his right leg from swinging in front. After the fastball — the normal fastball — the leg crossed over. After the changeup, it was more exaggerated. So we see three different deliveries: Fernandez underthrew, Fernandez threw normally, and Fernandez overthrew. When he underthrew, he was essentially offering his version of a lob. That was a Jose Fernandez batting-practice fastball. Based on what we can see, Fernandez gripped the ball like a heater, and he threw the ball like a heater. He just threw it as if he were warming up, instead of working in a game situation. Slow fastball. Fernandez wasn’t lying. Except for the part where he lied about giving Ortiz a bunch of more ordinary fastballs. But then, Fernandez did say he’d try to take a little something off. Maybe this was that attempt. Maybe Jose Fernandez doesn’t know how to take five miles off, instead of 15. Why would he? It’s not really something you’d ever try to practice. Fernandez slowed things down — he just happened to slow things down a lot. And it threw Ortiz off. 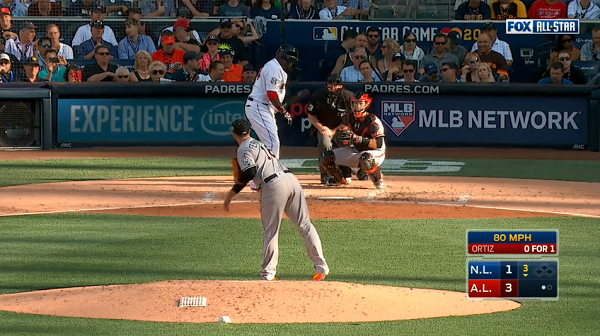 Ortiz was ready to swing, and swing big, but he held up, because Fernandez effectively tricked him. One of the fundamental truths in here is that a slow fastball is a changeup. It’s just a changeup you give away with a slower throwing motion that a hitter can detect. Scouts are always critical of pitchers who have varying arm speeds, because hitters see those and they function as tells. Generally speaking, pitchers need to be consistent. But the occasional change can confuse, so long as it’s unexpected. It’s no different from an eephus. This is how Jose Fernandez got away with a fastball that wouldn’t get the attention of many high-school programs. Players expect the elite to look elite. They’re not programmed to respond well to trickery. One of the worst fastballs David Ortiz has seen in decades threw him for a loop, such that he didn’t pull the trigger. There are so many ways for a pitcher to exert his control. It wasn’t a changeup. It was a slow fastball. 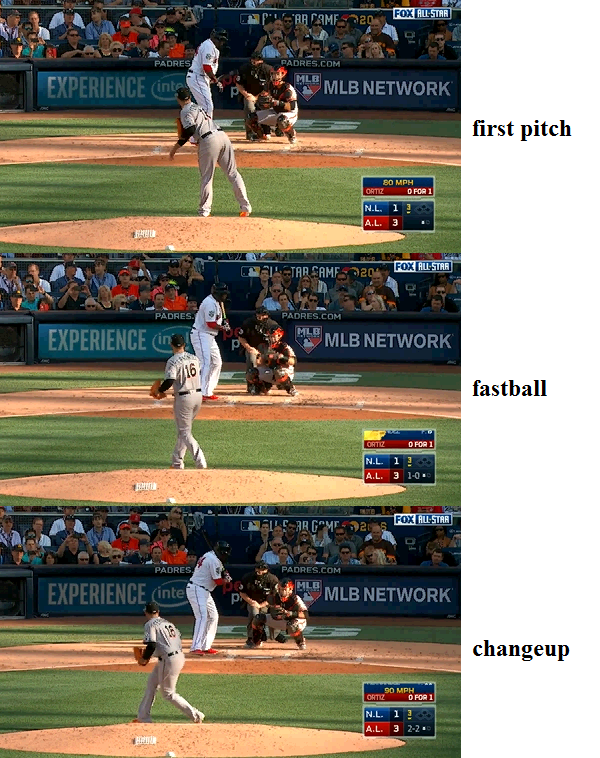 A slow fastball is a changeup, and that’s how it worked, but Fernandez used his fastball grip. Fernandez just might not know how to take a few miles off. And Ortiz just might not be ready for a lob. We hoped you liked reading Jose Fernandez Threw a Slow Fastball by Jeff Sullivan! Some day, that will be his ONLY pitch. that’s a really sad thing to think about. Not if he’s throwing it to his grandchildren, and they’re matching it while still in middle school.